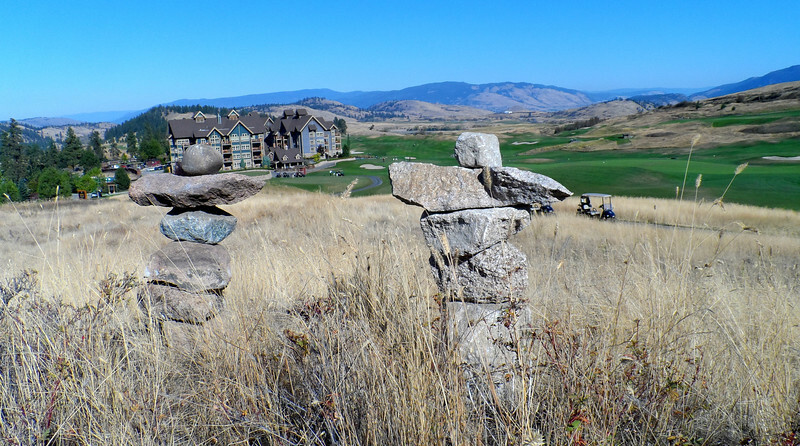 The inukshuks built around the Ridge course have become part of the magic we experience when we play. They peek out at you after you sink a putt. They watch your drive fly off the tee box. They wink at you as you drive by in your cart. Each has been named for someone at the resort – be it a member or an employee for something special they bring to the course and the overall experience enjoyed by all. When a non-member guest does something special on a hole, the inukshuk that lives on that hole becomes theirs for the day, and is theirs again every time they return. I hope those who have one named for them don’t mind sharing theirs with our guests when they visit. I also hope you get as much pleasure out of looking at them as I took in building them. The Ridge Hole, 1 As you stand on the first tee, you will see a pair of inukshuks high on the hill to the right. Trying to decide who they should be named after was difficult, then our manager of Human Resources had an idea. Each year, the resort names two employees as employee of the year. One is from the front of house. These employees are seen by our guests, and so is their work. The other is from the heart of house. The work done by this group of employees is seen, but the employees often aren’t. One of the things our guests often comment on is that all of the employees they meet seem to be happy in their work. We all want to be here. So, the two inukshuks are dedicated to our employees of the year. That means their names may change year over year, but what won’t change is the dedication and effort they represent.